Ever since it was announced, Paul Feig’s upcoming female-fronted Ghostbusters reboot has inspired a great deal of debate among the movie-watching populace. When filming kicked off recently near Boston, we were flooded with early images of the characters, but they were all unofficial, and details have still been kept largely under wraps. Feig, however, just took to Twitter to share something fun from the set with fans. This is, as you can tell, our first look at what the titular group of spirit-fighting heroes will be wearing when they hit the big screen next year. While there are some definite changes from the original, this is, more or less, what we expected to see from their new outfits. They definitley stuck with the jumpsuit aesthetic, though the color is a little bit darker, more olive than the earlier beige/khaki ensembles, and the cargo pockets on their pant legs are a bit different. Each member of the team will have a pair of sturdy boots--you definitely don't want to lose your footing when you have an unlicensed nuclear accelerator strapped to your back. The most major difference, as you can plainly see, are the orange stripes on the sleeves, which, if we're being honest, isn't that huge an alteration. Even the logo on the shoulder looks the same as this film's predecessor. 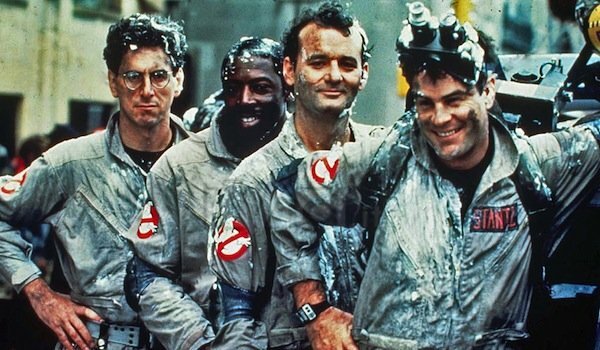 According to the most recent intel we have, Ghostbusters starts off focused on two characters, one played by Melissa McCarthy and the other by Kristen Wiig. The two collaborate on a book about how ghosts are real and exist among us. No one pays any attention to this tome, however, until a few years later when Wiig’s character lands a faculty position at Columbia University. When the book is discovered she is laughed out of the ivy-covered walls of academia and reunites with her old pal. Somewhere along the line they hook up with two new partners, Kate McKinnon and Leslie Jones, and the crew gets down to some serious paranormal investigation. There have been rumors about potential villains, including talk of an appearance from franchise vet Slimer. However, aside from the fact that Thor himself, Chris Hemsworth, has been cast as the Ghostbuster’s receptionist, filling the sizeable shoes left by Annie Potts, all we know for sure is that Ghostbusters is slated to hit theaters next summer on July 22, 2016.